World star Psy, the hero of “Gangnam Style,” is expected to make a grand return to the music scene with a new album in June. The album, to be released two years after the sensational “Gangnam Style” track in 2012, will include mostly “Psy-like” songs. The hip-hop artist once confessed that his latest song “Gentleman” did not reflect his personality at the concert held last December. “I will start fresh and make a new song that can show my style,” he was quoted as saying. The viral hit singer has been focusing on the new album since the second half of last year, other than holding a year-end concert in Korea. 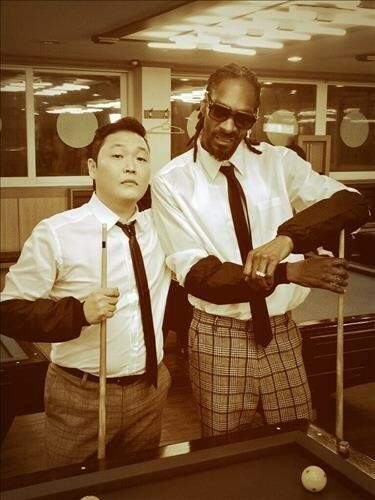 According to Psy’s agency YG Entertainment, he has already finished working on the new song with Snoop Dogg and music video with K-pop stars G-Dragon of Bigbang and CL of 2NE1 during Snoop Dogg’s visit to Korea in January. “Internationally renowned musicians jointly worked on Psy’s new album. We haven‘t decided whether the album will be a single or full-length,” YG Entertainment CEO Yang Hyun-suk said. Psy will appear on ABC-TV’s “Jimmy Kimmel Live: Game Night,” to air from June 5 every night of the NBA Finals, alongside Hollywood stars Cameron Diaz, Jason Segel, Mila Kunis and hip-hop mogul Snoop Dog. Given the long hiatus since his release of “Gentleman” last April, his participation on the TV show is seen as part of efforts to promote his new album. The world star is to join a string of festivals including “Hyundai Card Super Concert 19 City Break 2014” and “Now Festival 2014,” where he will showcase performances along with Maroon 5 and Lady Gaga, respectively.